… Entrepreneurs are not geniuses. We’re going to start with a simple premise — that you can create a good business idea from what you already know and love. We’re going to explore your skills and interests, and see if we can combine those into something interesting. It might not be a world shattering premise, or even something you decide to execute on, but that’s not the point. What it will do is teach you how thinking objectively about your approach and skills can get you into the habit of coming up with promising ideas and give you the confidence to do that, and keep doing it. We’ll start with your own skills, talents, interests, and experience, because it’s something you already have a great deal of knowledge about. You don’t need to do any research to find out what you already know and like — what we’re going to do is combine these in interesting and unusual ways, to see if anything fascinating and business-worthy comes out. I’ve designed this guide to be easy to use, but it’s up to you how you use it. Feel free to mix and match, jump around, and use it in a way that’s comfortable for you. Remember, it’s the way you think about and use this process, rather than the outcome that’s important. Understand all your main skills and how you could use them in business. Create a list of the things you care about. Work out the interests and skills that are most important to you. Create shortlist of ideas you can explore further. Something you’ve learned to do or are naturally good at. Is something you can actively “do” or practice. Might have been learned in a formal setting. Gives you a capability to achieve something. 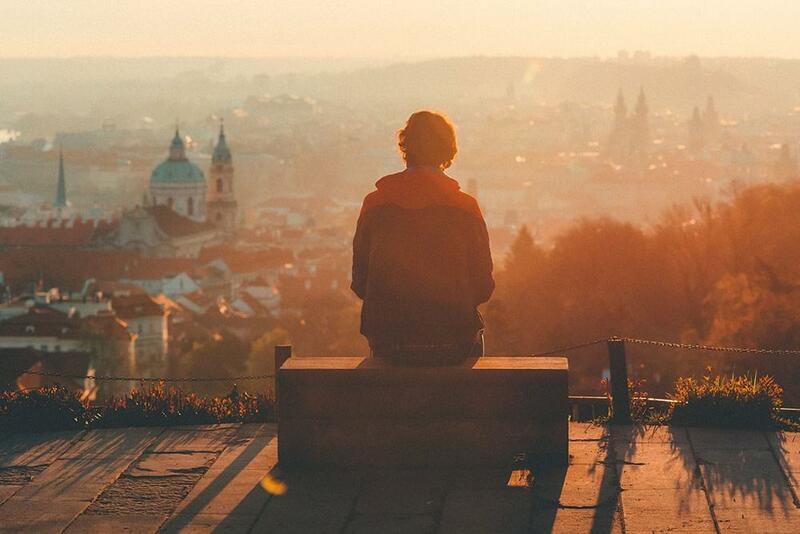 Explore the various areas of your life and work to find skills you’re good at. These don’t just need to be “hard” skills like computer programming or carpentry — they can include “soft” skills like parenting or being a good party planner. Write down anything you think is relevant. This doesn’t have to be an exhaustive list, but you should aim for a fair number of skills. Try to get a good selection across work, academia, your personal life, your social life, and your hobbies. 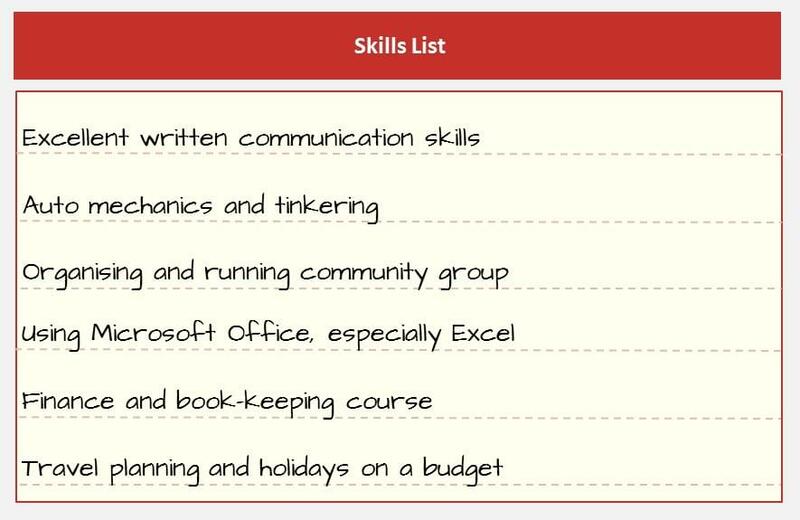 Here are some of the areas you can think about when you’re exploring your skills list. Qualifications and formal education — e.g. college or university studies, further education, formal tuition and academic training. Vocational skills — e.g. carpentry, mechanics, engineering, internships, apprenticeships, trade skills, construction, plumbing etc. Business and career skills — e.g. financial management, administration, HR, sales, operations, projects, marketing, management, leadership. Soft skills — e.g. social skills, pastimes, research, languages. Skills learned from hobbies and interests — e.g. creativity, sports, crafts, arts, playing an instrument. Life skills — e.g. child care, cooking, driving, home improvement. Looking at your CV, resume, or LinkedIn profile. Thinking about your employment history and the skills you needed. Reviewing your qualifications, certifications, and training. Seeing the skills you use every day. Talking to your friends about the skills they think you have. The important thing is that by the end of this stage, you should have a good list of skills you’re confident in. Below, you can see an example of a skill list. Just like with your skills, we’re now going to think about and list your interests. 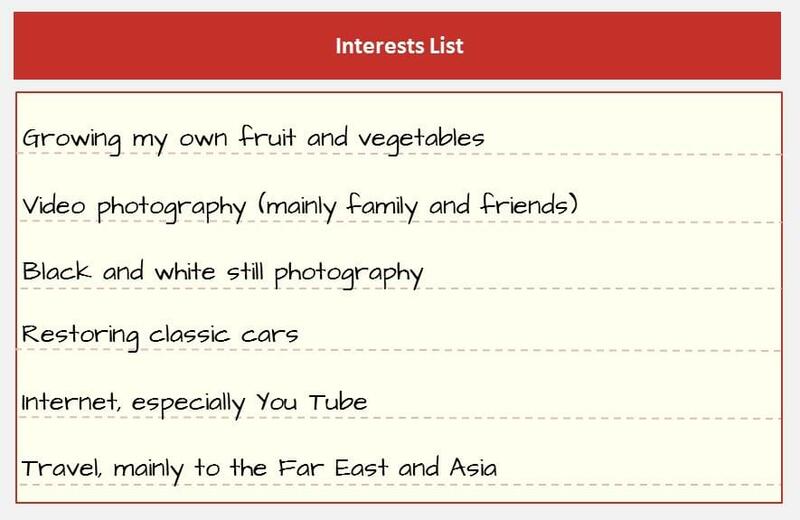 What counts as an interest? It’s something you choose to do in your spare time, whatever that is. It’s a pastime, hobby, or a way to enjoy yourself. It’s something that excites, inspires, or entertains you. It’s something you care about. Start thinking about and writing down your interests — you’ll want to put these in a different list to your skills. Explain your interests in the right amount of detail, and remember that sometimes your skills and interests might be the same. That’s fine, capture them in both lists. Business and work — e.g. budgeting, finance, investing, productivity. Entertainment — e.g. gaming, films, reading, drama, music, theatre. Technology — e.g. tablets, phones, computers, popular science. Home — e.g. model making, cooking, bread making, metalworking. Hobbies and pastimes — e.g. handicrafts, sports, fashion. Other — e.g. travel, pets, volunteering. Looking at Facebook and Meetup interest groups. Talking to your friends about shared interests. Keeping a quick diary of the things you do each day for a couple of weeks. You might not be able to get all your skills and interests noted down in a day, that’s fine. You can revisit your lists once or several times until you’ve captured the stuff you think is important. Below, you can see an example of an interest list. You’ll have two separate lists, one for your skills and one for your interests. 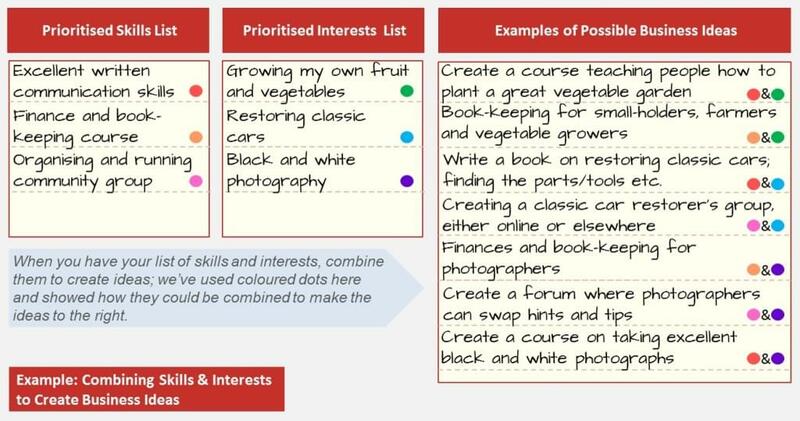 Chances are you’ve got quite a few entries on each list, which is why this step is important — you’re going to prioritize them, so when you start combining skills and interests, you’re not looking at thousands of ideas! Go through your lists and look at each item. Prioritize each one based on your experience, expertise, interest and enthusiasm for it. Since we’re going to be using these skills and interests to build business ideas, we’ll want to focus on the topics and areas you care about. Rate each item as High, Medium or Low, spending on how you’d feel about developing it into a business idea. Just write H, M or L next to each item. Take your time over this section, it’s important you’re satisfied with how you’ve prioritized everything. This is where things get interesting. What you’re going to do now is combine your skills and interests to create some interesting ideas that you might be able to develop into a business. Now, some of these combinations could be completely ridiculous, some could be strange, and others, well, they could have… potential. Take the first skill that you have rated as ‘H’ and put it with the first interest that you’ve rated as ‘H’. Write down the combination. 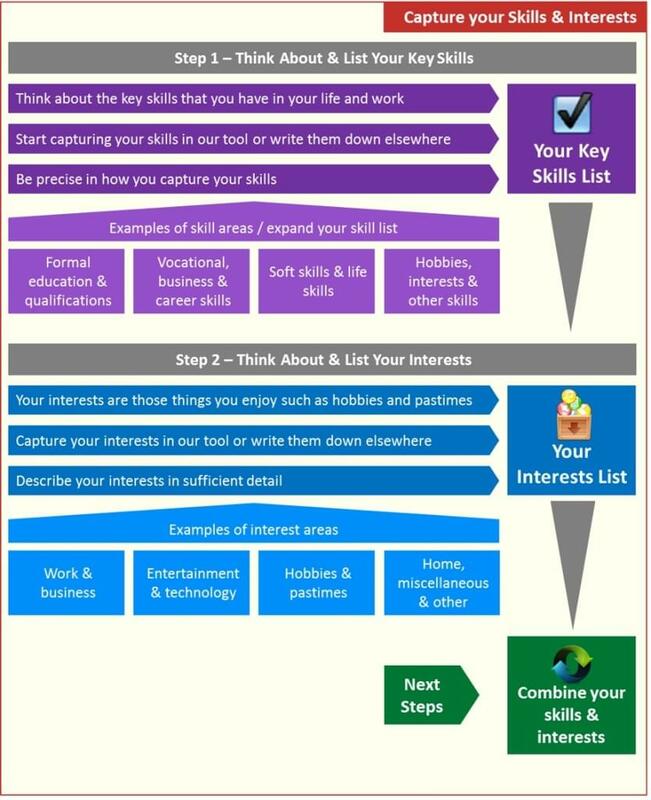 Combine that first skill with the second interest you rated as H and so on until you’ve combined your first skill with all ‘H’ interests. Next, go to your second ‘H’ skill and combine it with all ‘H’ interests and so on until you’ve combined all of your ‘H’ skills with all of your ‘H’ interests. If, after completing this step, you don’t feel that you have quite enough combinations, you can repeat this with your ‘M’ skills and interests. By the time you’ve finished, you should have a reasonable list of combined skills and interests that you can develop into a business idea. You can see how this would work below. You’ll now have a long list of business ideas — some that are objectively terrible, a number that are mediocre, and possibly a few that could become something. Go through your ideas and delete any that are completely impractical, ridiculous, too complicated, too expensive, or that you don’t like the look of. Don’t be afraid to be ruthless! Does the idea excite you? Do you understand enough of what the idea might need to bring it to fruition? Do you think there’s a market for a product or service based on the idea? Is this something you could see yourself doing for the next year or ten? Do you think people would pay for a product or service based on the idea? If you answer yes to all those questions, you’ve got something you can explore further. 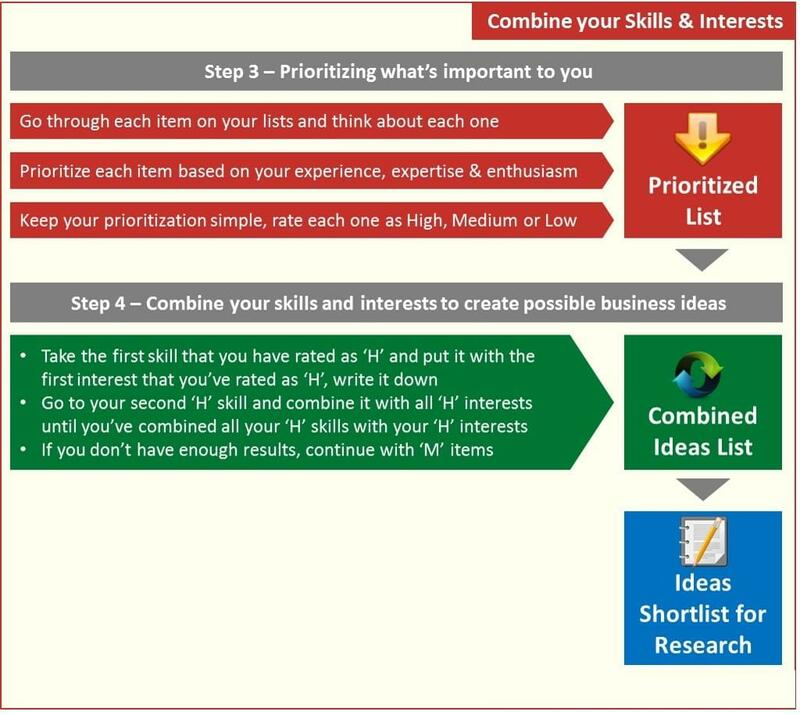 Create a shortlist of any ideas you think are worth investigating. Once you’ve got your shortlist, you’ll want to complete some market research and validate your ideas. Testing and validating ideas is critically important and shouldn’t be rushed. Here are some good starting points to test and validate ideas, products, and services. I’ll finish with another secret about entrepreneurs — it’s not really about the ideas, it’s about the execution. One mediocre idea, well-executed, is better than a thousand awesome ideas you do nothing with. So, generate your ideas, find something you’re passionate about, and, most importantly, Go Do It!